Community bank executive teams and boards of directors don’t have the same analytical tools as the larger banks when it comes to evaluating mergers and acquisitions. And that leaves most community banks at a distinct disadvantage. So what can community banks do? Mustafa wants to arm community banks with analytical tools that will bring them big bank knowledge and take into account post-recession changes in economic, monetary and regulatory policies. “Community bank M&A tools need to be adapted and reconfigured for CEOs and executive teams,” he said. At several AOBA sessions, investment bankers and others touted the use of legacy analytics, such as loan review, to extrapolate future bank performance when analyzing an M&A deal. Mustafa, however, contended such tools were useful prior to the recession because they were an adequate predictor in a stable environment. That is no longer the case. To start, community banks must devote more time to the pre-due diligence phase of M&A, he said. Otherwise they risk wasting enormous time and resources on deals that they won’t – or shouldn’t—win. Every phase of pre-due diligence should then be confirmed, analyzed and drilled own in the actual due diligence phase. His presentation showed that a traditional loan review process fails to take into account when a loan was originated. Yet vintage is a key tool that community banks should use in evaluating a target bank – and itself. As Mustafa stressed, the one thing a bank cannot change when it buys another bank is the yield on the loans it acquires. If community banks don’t truly understand their own portfolios, they won’t know which potential target will be the best strategic fit. 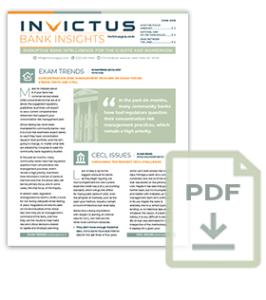 Invictus uses a LoanLayering™ system to break down portfolio loans by vintage, and then subjects the portfolio to a capital stress test to understand how changes in monetary and regulatory capital policies would affect those loans over time. That analysis leads to a risk/return assessment of a bank’s loan portfolio, and it is essential in evaluating an M&A target, Mustafa said. A static pro forma analysis, looking at a loan portfolio, might show 10 percent growth in the next three years. Yet a vintage/stress testing analysis that takes into account the risk/reward environment would reveal that a 40 percent turnover of the portfolio is required to achieve that 10 percent growth. A bank that doesn’t have access to such information is entering into an M&A transaction blindly, Mustafa argued. All large banks are required to undergo stress testing as part of changes in the post-recession regulatory environment. Most community banks don’t use stress testing as a tool. But Mustafa showed that community banks that used capital stress testing were able to lower their required capital ratios, and use the excess capital to increase their M&A war chests. He also showed how that excess capital–FreeCapital™– affects the value of a deal. Banks with negative FreeCapital™ are more expensive, and those with more FreeCapital™ than is apparent via a traditional analysis are actually better buys. Mustafa urged the banks in the audience to evaluate a deal in the appropriate strategic context of their own bank. Using the right tools, they can then understand the threshold at which an acquisition is actually better than organic growth. He showed how analytics can quantify a target’s value to an attendee’s bank. Figuring out the return on an acquisition versus the return on organic growth enables a bank to make a bid or no bid decision. It also helps quantify at what ceiling price an acquisition makes sense. He also showed why it makes sense for community banks to be proactive in M&A instead of waiting for investment bankers to bring deals to them. If a bank can identify targets it wants to buy – even ones that are not for sale – it can use analytics to make a smarter case to the target that a private deal is a win-win for everyone.